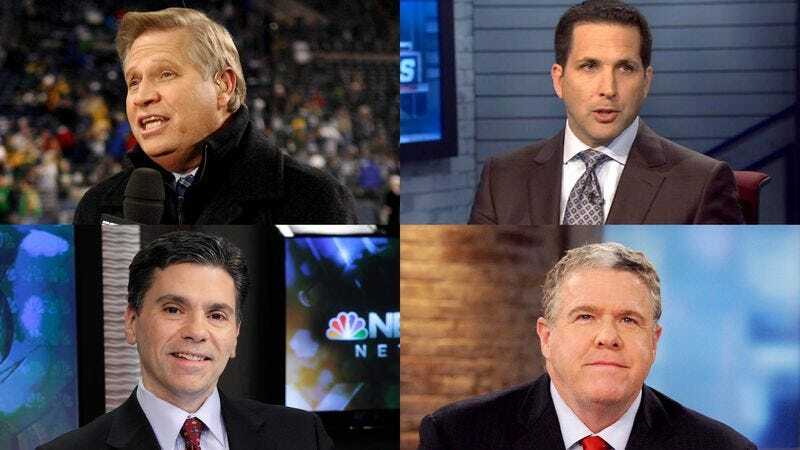 NEW YORK—At a loss as to how they could emerge from a weekend of regular-season football without any fresh insight whatsoever, ashamed and humbled members of the sports media admitted to the public Tuesday that they learned absolutely nothing from week 11 of the NFL season. “It is with heavy hearts that we announce today that, despite watching the full slate of games on Sunday and Monday, we were unable to draw a single new conclusion about any player, coach, team, or division in the NFL,” said Sports Illustrated columnist Peter King, speaking on behalf of John Clayton, Mike Florio, Jay Glazer, Chris Mortensen, and all other sportswriters across the country. “We realize that millions of fans count on us every week to tell you how the playoff picture has changed, which quarterbacks should be benched, which teams are poised to make a deep postseason run, and which coaches could be on the hot seat. But we failed you. Not only did we let all of you down, but we let ourselves down as well. All we can do is ask for your forgiveness and do absolutely everything in our power to ensure that something like this never happens again. This is not who we are.” King then pleaded with NFL fans to have patience until next Sunday and simply re-read any articles about the major takeaways from week 10 in the meantime.